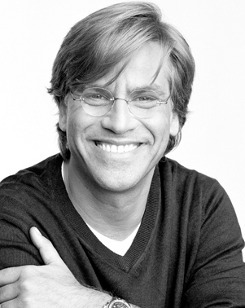 Aaron Sorkin was very involved in drama and theatre at his high school, and graduated from Syracuse University with a degree in Theater. He spent much of the 1980s as an unemployed actor, then tried writing. His first play, titled Removing Doubt, wasn't successful, but his second play, a comedy called Hidden in this Picture, was staged at the West Bank Cafe Downstairs Theater Bar in New York. Sorkin spent a year and a half writing his third play, A Few Good Men, a courtroom melodrama with a military setting. He was never in the military and never studied law, but Sorkin was inspired by accounts of a Guantanamo Marine accused of murdering a fellow Marine. Someone smelled a hit, because A Few Good Men wasn't staged at any downstairs theater bar like his previous play; it had its world premiere in 1989 at the Kennedy Center in Washington DC, with Tom Hulce in the lead. On the big screen, Tom Cruise and Jack Nicholson yelled at each other a lot, and the movie garnered critical acclaim and enormous box office, making Sorkin a hot Hollywood commodity. Sorkin wrote The American President, a romantic comedy about a President who falls in love with a lobbyist. With Michael Douglas and Annette Bening, it was popular albeit predictable, but it wasn't half what Sorkin had written. Most movie screenplays run about 120 pages, but Sorkin had pounded out 385 pages of dialogue for American President. "I completely fell in love with the sound of my own voice," Sorkin has said. The leftover pages of The American President became the starting point for Sorkin's best-known work, The West Wing. It took place behind the scenes at the White House, where the staff, in Sorkin's words, "set aside probably more lucrative lives for public service. They are dedicated not just to this president, but to doing good, rather than doing well. The show is kind of a valentine to public service. It celebrates our institutions." For viewers who also read a newspaper now and then, TWW did more than simply celebrate the White House, it mythologized the institution. It told viewers, week after week, that their leaders are men and women of the highest character, wrestling with moral dilemmas and usually making the right decisions for the right reasons. It is, in other words, it was high-quality television for viewers who can't handle the truth, or just wanted an hour away from the truth. After the terrorist attacks of September 11, Sorkin wrote a very special episode of The West Wing, which was filmed and aired within the month. The episode, called "Isaac & Ishmael", drew TWW's highest ratings ever. Yet after four seasons and several missed deadlines which cost the studio millions of dollars, Sorkin quit TWW in 2003. There were also suggestions that the show had lost its luster after September 11, as fictional politics were displaced by real world events. Sorkin also created Sports Night, a critically acclaimed late-1990s TV comedy-drama about life behind the scenes at a cable sports show. The dialogue was fast and clever, but the ratings were quiet, and the show didn't last long. In 1995, Sorkin checked in at the Hazelden Institute, a rehab facility in Minnesota, for his freebase cocaine addiction. In April 2001, he was arrested at Burbank Airport when hallucinogenic mushrooms, marijuana, and crack cocaine were found in his baggage. He was later ordered into a "drug diversion program", which included attending classes and support meetings. His wife left him, but that seems to have been his only real punishment.